Alistair Stewart has written a behemoth in The Original Bishops. Let me be frank up front, Stewart’s level of writing is fairly beyond me. Theology is my specialty. This is a scholarly evaluation of church history, extra-Biblical documents and Biblical texts concerned with church authority and leadership. The end result, The Original Bishops is an overwhelming amount of condensed information to challenge long held presuppositions concerning church leadership and how this authority developed historically. In light of my limited knowledge, I chose to focus on Stewart’s contention that most scholarly works “repeat the same ‘facts’” (23) in defense of their ecclesiology. These “facts” are the basis of most evangelical and conservative works that I have read and dealt more directly with the Biblical text. The major (and familiar) points Stewart strives to show as “baseless” include “the synonymy of episkopos and presbyteros, the emergence of a monepiskopos from a collective presbyterate, and the origin of presbyteroi in the synagogues” (23). As a result of this focus, I will focus this review to the first three chapters of The Original Bishops. Chapter 1 argues against the synonymy of presbyteros (typically rendered “elder” in English) and episkopos (typically rendered “bishop” in English). Stewart qualifies his position by declaring the terms overlap but that “overlap is not the same as identity” (29). Instead of synonymy Stewart proposes a city-wide federation of delegated presbyteros (“elders”) from local congregation. These presbyteros may have also been the ruling episkopos of a congregation. Admitting there is a “prima facie case” for any rejection of synonymy Stewart steps through the pertinent chapters of Scripture and extra Biblical accounts to demonstrate how the federation view makes sense and offers clarity in the cities of Rome, Corinth, Ephesus (29-43). Though his opinion of Scriptural authenticity will bother conservatives, Stewart’s treatment of Acts 14:23, Titus 1 and other pertinent passages is relevant and formidable to many modern arguments over the Biblical role of elders. Stewart demonstrates how a “synonymy of episkopos and presbyteroi” is sometimes a viable reading but in others, a presupposition brought to the text. In Chapter 2, Stewart addresses the economic functions of the terms episkopoi and diakonoi. The wealth of information is staggering but helpful to understand how the role of episkopos would naturally lend itself to the owner of house in which the church met. Effectively, the episkopos role was substantially more focused on money, alms-giving and other financial ministry concerns. Stewart provides strong arguments from the Didache, 1 Clement and other ancient texts to demonstrate the contextual validness of these term (67-72). The resulting implication for the relationship of episkopoi, oikonomoi, and patronage makes sense of Stewart’s argument (86-95) as well as Philippians 1 and Acts 20 (71-74). Stewart splits chapter 3 into two major sections. In the first, he presents the evidence against foundational “consensus of collective leadership” for local congregations (120). Addressing both purposed Jewish and non-Jewish origins of presbyters/elders (120-137), Stewart convincingly demonstrates “there is no evidence to support the oft-repeated assertion that presbyters are found within the synagogue, and so none to support the position that Christian churches were managed by presbyters along a synagogue model” (136). The conclusion of the chapter (and The Original Bishops) consists of Stewart proposing his view on “the formation of the threefold order in early Christianity” (138). It is here that Stewart addresses 1 Timothy and argues “presbyters are simply older men” (140). Stewart insightfully notes “if 1 Timothy were read without reference to Titus or to other contemporary documents, nobody would suppose that presbyters held office” (141). Stewart demonstrates how the “presbyters kata polin” of Titus are not synonymous with the elders in 1 Timothy (143-157). Instead, at the foundation of the church, “the episkopos is the steward (oikonomos) of the household and the diakonoi are the servants” (157). In chapter 4 Stewart begins to describe the expanding role of episkopos in the emerging church. It is here that Stewart addresses 1 Peter 5, an important text in in the synonymy of episkopoi and presbyteroi. Stewart does so because he attributes a late dating to 1 Peter contra many conservative scholars. So for Stewart 1 Peter is an example of the emerging post-apostolic church whereas for many evangelicals 1 Peter remains an example of apostolic church instruction. Despite this difference, the discussion and results from 1 Peter 5 are important nonetheless (186-191). Stewart demonstrates that this key text does “not necessarily demonstrate synonymy between episkopos and presbyteros” (187) and even affirms “ministry exercised by local episkopoi leading to localized federation” (191). In conclusion, Alistair Stewart does a magnificent job of laying out his case in The Original Bishops. This is a highly technical work and much of it was well past my knowledge or ability to render scholarly judgment. 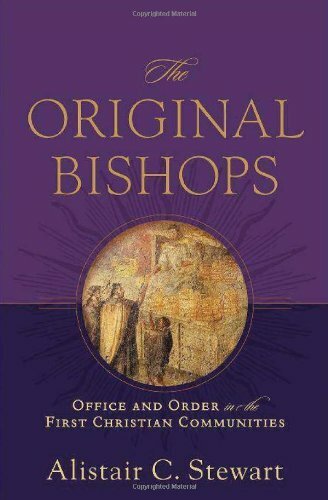 The Original Bishops is significantly beyond the reading level of laymen and will likely interest only graduates interested in the subject. Far from a detriment, this is solely a warning to readers who may find themselves bowled over by this immense work from Stewart.